I'm all for a shortcut when it comes to cooking. If Delia can write a whole book about cheats and Mary 'fesses up on Bake Off that she doesn't make her own Filo Pastry I reckon I'm in good company. Personally I'd prefer to use a pre-prepared product that helps me short circuit cooking times and techniques than resort to a ready meal. I'm not saying they don't have their place but there is definitely room for a halfway house between cooking everything from scratch and popping a ping meal in the microwave. In today's recipe I've been working with Giovanni Rana and their new Italian Indulgence Parmigiano-Reggiano Sauce. It's an instant time saver that will allow you to create fabulous food without a faff. The fresh chilled sauce is made with authentic PDO Parmigiano-Reggiano blended with cream. Whilst it's undoubtedly great served traditionally with pasta it also makes a wonderfully versatile ingredient. A second new addition to their Italian Indulgence range is a Basil Pesto with Pine Nuts & Garlic. Giovanni Rana’s authentic pesto is vibrant and rustic and lends itself to countless dishes, from simple spaghetti through to pesto topped salmon fillets and stuffed chicken breasts. 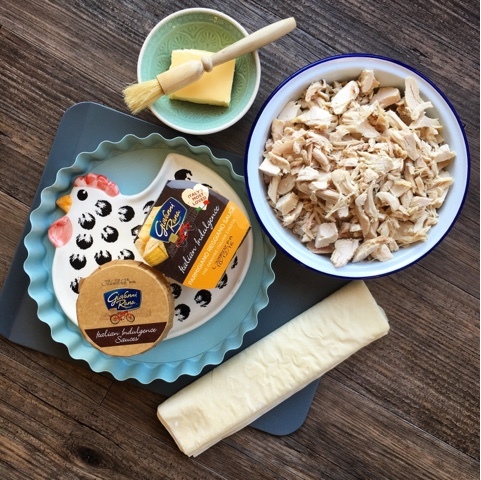 In my recipe today I've used the wonderfully silky and creamy Parmigiano Reggiano sauce to help make the filling for a showstopping Chicken Pie. The timing of publishing this recipe is particularly apt with the festive season approaching. My Parmigiano Reggiano Pie would be the perfect way to use up leftover turkey and you could easily add in some ham, cranberry sauce or even leftover sprouts! Filo pastry is a fantastic shortcut and makes an impressive finished product for very little effort. Pop a pack of filo and a tub of Italian Indulgence Parmigiano-Reggiano Sauce in your trolley when you do the Christmas Shop and you'll be sorted for an effortless twixtmas meal. To make it year round with chicken, my top tip would be to cook a whole chicken in the slow cooker. Pop it in with nothing else and cook on low for 6-8 hours. I promise it will work and you'll have fantastically succulent chicken just falling off the bone. The by-product will be a wonderfully rich chicken stock which will be perfect to use in the pie instead of a cube. Win win! 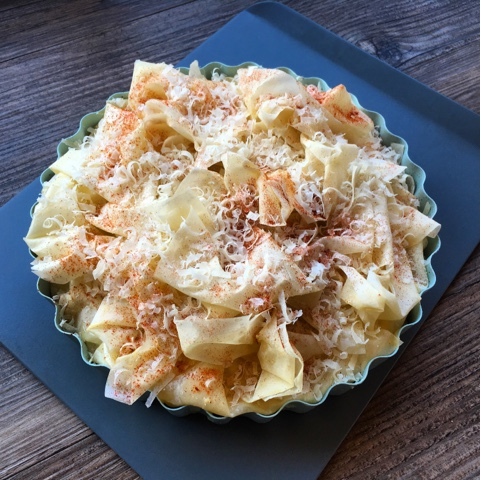 In a large bowl mix together the shredded cooked chicken/turkey, chicken stock, Parmigiano Reggiano Sauce, chopped parsley and smoked paprika. Combine well and season with freshly ground salt and pepper. Brush the second pastry sheet with melted butter and this time lay it down into the tin the other way round, so it drapes over and lines the base. Repeat the criss-cross layering with 6 out of the 8 butter brushed filo sheets. Spoon the cheesy chicken mixture into the pastry lined tin. Crumple the final 2 buttered sheets of filo to cover the top then fold in all of the other pastry to form a parcel. Brush the top with the last of the butter and sprinkle over the grated Parmigiano Reggiano and some more Smoked Paprika. Remove the tin and transfer the Parmigiano Reggiano Filo Pie to a serving plate. Disclosure : This is a commissioned post for Giovanni Rana. As always, all views expressed are my own. A quality cheat ingredient hardly even counts as cheating in my book! 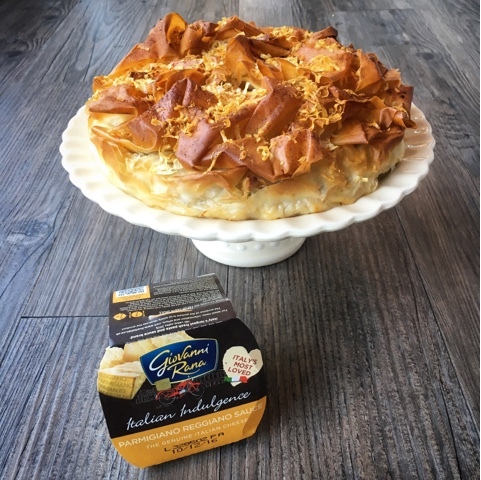 Looove the look of this filo pie, what a great way to use roast chicken leftovers too - we roast a chicken regularly and always have leftover meat. The great thing is that you could add in whatever else you have leftover from a roast chicken meal, potatoes, veggies and so on. I'm not very keen on some ambient sauces but the fresh ones really are as good as homemade. I love this filo twist on a pot pie. It's very beautiful. I've tried some packaged sauces and they can be very good. I'll keep an eye out for this brand. Thanks! 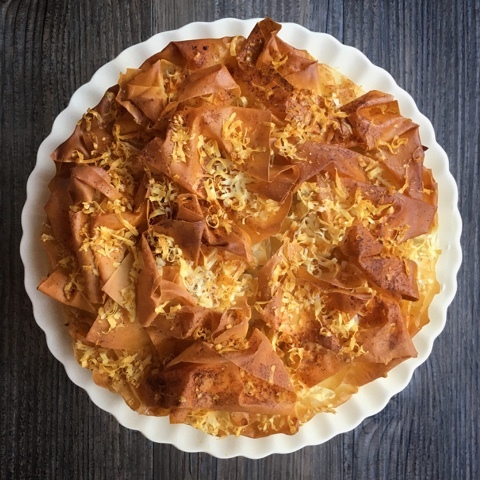 Filo is such a versatile pastry. 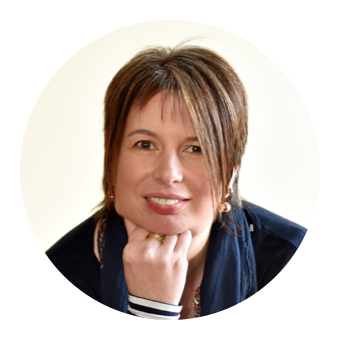 I love using it and you can create something very impressive with very little effort! 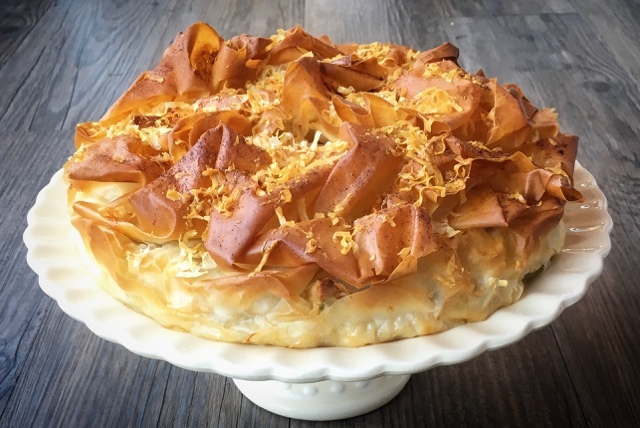 Love the twist on the traditional Chicken Pot Pie and the use of filo instead of puff pastry. SO cool. I often use filo in a pie, I expect I'm kidding myself that its healthier than puff. That may not be the case with all the melted butter brushed on the top! Oh well, it tastes good so it's worth it. Oh wow how exciting! I am very jealous. Italian chefs are always so passionate, I bet that was a great experience. Wow, that pie is an absolute showstopper. I agree, shortcuts are great - especially when you can use one to create something like this. That Giovanni Rana sauce sounds so incredibly delicious. This is such a fantastic way to use up roast poultry leftovers. Genius! I've never tried that sauce before but it sounds really good - I'm heading to the supermarket this afternoon - will look out for it! So- I had to let you know that instead of using stock, I used leftover turkey gravy and left over turkey. I enjoyed very much. Loved the crunch on top. This is a huuuuug show stopper. The sort fo ting I would love to treat my friends to using xmas leftovers. You know I have never used Giovanni Rana Parmigiano Reggiano sauce, I will look out for it next time I am in the shops.